Set out on high-speed LEGO Star Wars adventures against Jedi Master Mace Windu, with General Grievous' Combat Speeder. 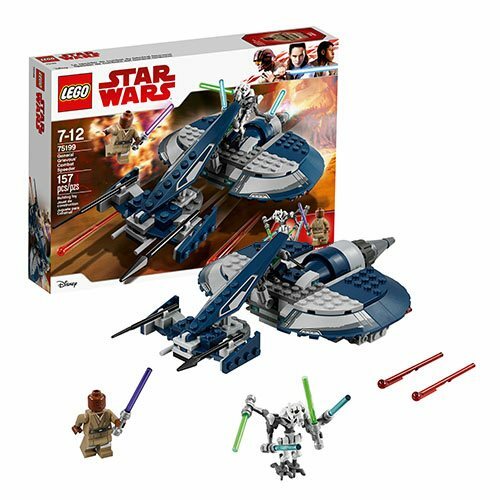 Featuring spring-loaded shooters, sleek design and storage underneath for the General's 4 Lightsabers, this fast speeder from the highly successful Star Wars: The Clone Wars animated TV series is the perfect way to immerse any Star Wars fan in Sith vs. Jedi dueling action. This LEGO Star Wars toy includes a Mace Windu mini-figure and General Grievous figure. Includes 157 pieces. Ages 7 to 12.